Al Mina (IBL) added to their roster 28-year old Congolese ex-international forward Eric Kibi (198-104kg-90, college: Abil.Christian). Kibi is a dual citizen owning also DR Congolese passport. He just played at MBK Handlova in Slovakian SBL league. But in three games he recorded only 0.7ppg this season. 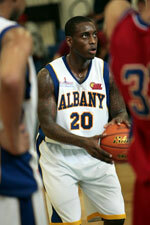 Kibi also played for GET Vosges (NM1) in league where in 5 SBL games he averaged 6.8ppg, 6.0rpg, 2.4apg and 1.4spg. He also represented DR Congo at the Afrobasket Championships two years ago. His stats at that event were 4 games: 3.5ppg, 3.5rpg. Kibi is quite experienced player. He has played also professionally in Canada (London Lightning and Ottaway SkyHawks), Denmark (Randers), Germany (Hertener Loewen, BG Halstenbek/Pinneberg and Rendsburg), Montenegro (Strsljen) and Spain (L'Hospitalet). 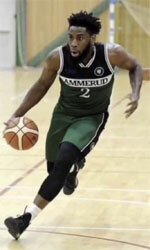 Kibi attended Abilene Christian University until 2012 and it is his seventh season as a professional player. On Kibi: Super athletic position 3 player who has great face up game and can handle the ball in the perimeter to produce with his midrange game, using pull up shot, or strong drives to the basket. He has excellent inside back to the basket game, can use strength to back down players for his drop step move or hook shot consistently. In transition offence or fast breaks, possess great speed, quickness to score in open floor. Strong with the ball and drives to the basket can finish with contact and dunk. Great individual defender in the perimeter and also uses strength comfortably to defend bigger players inside. Has excellent nose for defensive and offensive rebounding, catches the ball on the highest point.